Can flipbook created by MAC maker be viewed on iPhone, iPad or Android? If you have used the flipbook makers of Windows version, must be impressed by the function of also make mobile version. Now, frankly FlipBook Creator for MAC allows you to convert mobile version with vivid page-flipping effect and sliding. From now one, you can popularize the flipping books more widely either on computer or mobile devices. Your online book or catalog will get much more attention than before due to the wide-spreading paths (PC or mobile). That is to say, people can get the page-flip book from multiple channels. So first, your books are becoming more and more popular for its easy achieving and decent designed appearance. Anyway, it is worth for you to make a mobile version to improve fame or increase sales. Step1: Launch FlipBook Creator for MAC, and then import a PDF file in for editing. Step2: Edit current imported PDF. 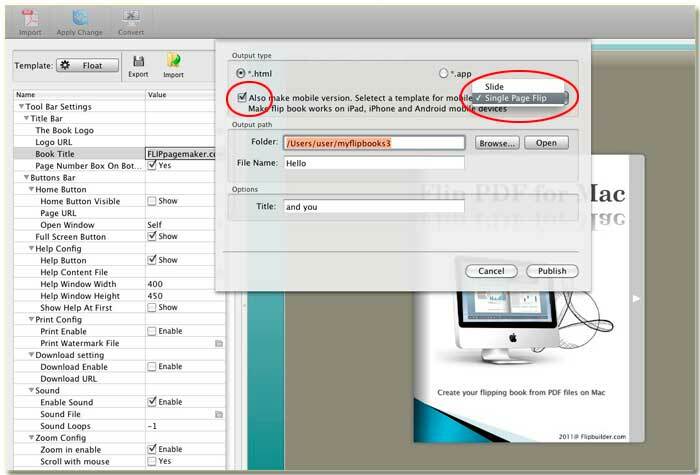 Step3: click Convert to open the output settings window, and then as below illustration shown, check the mobile option and then select the book displaying effect from the afterward selection window. Note: there are 2 options for the mobile book displaying. One is slide it means the pages will slide when you try to access to next page. Another is flipping, it might be familiar for series of our flipmaker products, which displays as real paper book with flipping flash effect.